Ducati Manchester are excited to announce the arrival of the limited edition Monster 1200 25 Anniversario. This exclusive edition celebrates 25 years of the Ducati Monster. Only 500 of these Monsters will be produced – so contact us today to reserve yours. Remember we have payment & finance packages to suit all budgets, so there’s never been a better time to ride a new Ducati Monster. Below is the official press release from Ducati. Limited edition of only 500 numbered pieces. A special colour scheme, machined from solid components, high-quality finishings, carbon fibre and a lot of technology Bologna, Italy, 27 June 2018 – The Monster was first presented at the Cologne trade fair in 1992, production began on 5 March 1993 and in just a few years the bike reached icon status in the world of motorcycles. The model was responsible for launching the category of Naked sports bikes and an ever growing and ever more devoted community of riders grew up around it: the Monster fans. To celebrate 25 years of history of the most iconic of the Bologna-based manufacturer’s motorcycles – over 325,000 of them have been made since 1993 – Ducati has decided to create the Monster 1200 25° Anniversario. Only 500 numbered motorcycles will be produced of the Monster 1200 25° Anniversario , which for Ducati embodies the maximum expression of a Naked sports bike. It is characterised by an exclusive livery featuring the three colours of the Italian flag on the nose fairing, fuel tank and passenger seat cover, inspired by the 2008 Monster S4RS Testastretta Tricolore. The special colour scheme partners perfectly with the prestige seat which is embroidered with the 25th anniversary logo. The gold coloured frame and forged Marchesini wheels with W spokes in the same colour are another distinguishing feature of this Monster, which also has numerous other prestigious details machined from solid, such as the mirrors, frame plugs, handlebar end weights and the petrol cap, which is a standard fitting. The articulated brake and clutch levers as well as the plate holder are also in aluminium, while the front and rear mudguards, the keyhole cover and the exhaust heat guard are in carbon fibre. The Monster 1200 25° Anniversario also comes with a bike cover, decorated with the particular logo of this special limited edition. 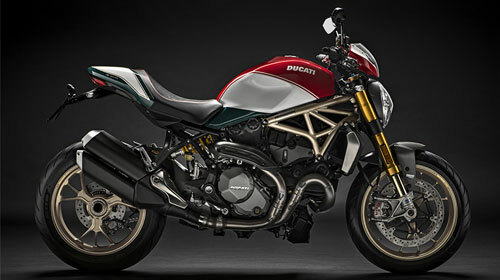 The Monster 1200 25° Anniversario will be available in the UK towards the end of the year and has an SRP £17,390 OTR. CONTACT DUCATI MANCHESTER, PRESTON, OR STOKE FOR MORE INFORMATION.